Referee George Clancy is unlikely to forget his first Six Nations appointment - and neither is Scotland coach Frank Hadden. Clancy was the whistleblower for Scotland's Valentines Day date with France in Paris but there would have been very little love for the Irishman following the controversial clash at the Stade de France. Fulgence Ouedraogo's second half score gave the hosts a crucial advantage in a closely fought contest but should not have stood. Replays showed the scoring pass from wing Maxime Medard was forward and Clancy may have spotted this had he not been knocked to the ground in the move building up to the score. To his credit he clarified with his assistant before making a ruling but two wrongs don't make a right. It re-opens the debate about the use of television replays for such aspects of the game. Currently officials can only refer grounding issues but with the abundance of technology available surely the, "Is there a reason why I shouldn't give a try?" question for the TMO become common parlance in such situations? OK, the 22-13 winning margin was greater than a converted try but the impact of that bad decision goes beyond the score line and Hadden was right to be annoyed. The decision was a cruel blow to the Scots who were a completely different side to the one of the same name that made their Championship bow against Wales last weekend. The signs for Scotland are positive following their second successive defeat that leaves them to contemplate a likely Wooden Spoon decider against Italy in a fortnight's time. The Scots produced more attacking endeavour in the first ten minutes of today's clash than they mustered in a full 80 minutes at Murrayfield last weekend and suddenly looked a good bet to notch their first win in Paris for 10 years. However, they were also their own worst enenemies with countless errors and sloppy penalties eventually ruining any chance of them re-living the glories of 1999. Hadden has been criticised for his selection policy of late but he must get some credit for injecting some life into his line-up. He obviously noted that France struggled with the pace of the Irish and threw down the gauntlet to the Evans brothers - Max and Thom. They rose to the challenge and were both involved throughout - Max going close to scoring a try in the first half and Thom dotting down in the second. Scotland were committed to an expansive approach from the off and it brought some reward but they lacked composure at key times - opting to force the pass when it was not on. It aimply looked like they were not used to playing that way. It was refreshing and heartening all the same. 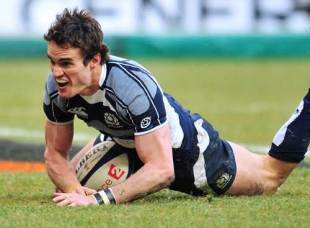 However - the pack still poses problems for Scotland with the second row of particular concern. As much as Scotland improved from their last outing, France suffered an equal dip in performance. Handling errors littered their build-up play and the flashes of brilliance that lit up Croke Park last weekend were notable by their absence. The result? Jeers and whistles from the fickle Parisian crowd. This was a big step forward for Scotland who can look forward to the clash with Italy with confidence. And if France want to prolong their title challenge they will need to rediscover their golden touch ahead of the visit of Wales.